How do you get dinner on the table in about five minutes flat? We’ve all had those nights. It’s dark, cold, winter. We got stuck at work with something at the last minute. The kids are starving and have no problem telling you that you’ve starved them for hours. LOL. When this happens, I immediately think bowl. Not just any bowl though. I grab a bunch of random veggies and things out of the fridge, and throw as many textures and colors into that bowl that I can possibly fit. (It gives me focus so that I don’t commence yelling or crying in the corner as I dial the pizza guy.) Seriously, this is when that hour you spent on Sunday chopping and grilling will save you from a meltdown while you throw dinner at the hungry crowd. You’ll notice that this “recipe” has no specific measurements. There’s a reason for this. You don’t need a recipe. In fact, it’s more family friendly if you don’t follow one. Everyone gets to make their own bowl, and customize it for themselves. If someone hates cucumbers but loves tomatoes, then they can leave out the cukes and load up on the tomatoes. Make Your Own Bowl Night turns out to be kinda fun. The kids get to control the mix they put in their bowl, and you pretty much just put a bunch of things on the table. The most it takes is maybe a quick sec in the microwave if you want your meat or veggie burgers heated. Chop your veggies and herbs, and place in a bowl. Heat your veggie burger or protein of choice, if desired. Toss in some spiced chick peas for crunch and flavor. Thin the hummus with a little water and drizzle on top. These are the ingredients I used in my bowl, but don’t feel limited by this list. You can use any leafy green like romaine, kale, spring mix along with salad veggies like sliced peppers, mushrooms, carrots. Any protein works so use a veggie burger like I did or grilled chicken, steak strips, pork, ground beef even. 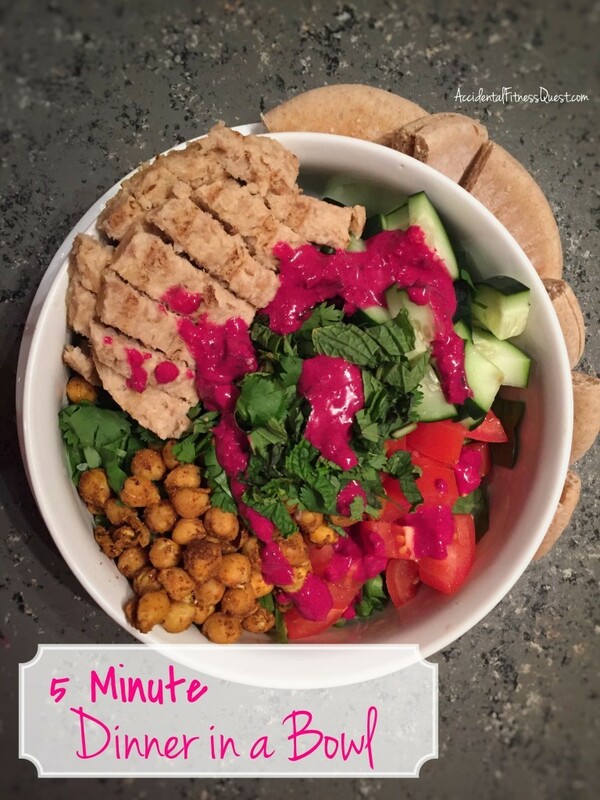 I had the batch of moroccan chick peas that were perfect to throw in the bowl for some crunch. Tahini, hummus and similar flavors go great with Moroccan spices, so I grabbed the beet hummus from the fridge to drizzle on top. It just so happened that the gorgeous hot pink color (no filter on that pic above) blended perfectly with the other colors in the bowl. It took five minutes to pull everything out, throw it in a bowl, and put a happy smile on my face. I even had spare time to slice a pita to have with it. Think colors, flavors, textures when you put meals together and they turn out a lot more fun. If you’re interested in working with me to get meals together fast while working towards your health goals, I’d love to chat. Drop me an email, or come on over to Facebook and ask a question. Are you trying out one of my recipes? Don’t forget to snap a pic and tag it with #AFQrecipes when you post it. I’d love to see what you’re making! I do bowls, soups, salads, wraps. I rarely have the same combo twice, LOL. I’m a sucker for all things in a bowl. I’m glad paths crossed too. I love your mindset!